Gabriele Basilico, the Italian photographer, is one of the best known and authoritative voices in contemporary photography of architecture. For more than thirty years he has travelled around the cities of the world with a twofold approach: on the one hand, he prepares his intervention on paper, following precise typologies, on the other hand, once he is on site he lets himself go, to be led by random situations, immersed in the smells and submerged by the noise. This gives rise to photos that are steeped in both rationality and sensibility: an initial idea is filled out by objects from the tangible world, a rigorous architecture of two dimensional space is enriched by the numerous and varied moments of life. A geometry set down on paper conveys the empirical history of a place. Basilico’s shots fix the memory of a city and by virtue of a continual registration move ever closer to the deepest essence of the principle of urbanism. The cities tell their story in these images and speak of love and war, and the hopes and delusions of their inhabitants, both absent and present at the same time. With a class of secondary school students we met the artist at his exhibition Istanbul at the Fondazione Stelline in Milan, and thus a dialogue of many voices was formed, a lecture-interview, or, if you wish, an interactive conference. Barbara Fässler: What are the pictures of? B.F.: How is the city depicted? Paolo: I noticed that you hadn’t portrayed the city centre, the historic centre as is usual, but rather the poorer areas. G.B. : Yes, exactly, in fact this choice elicited protest from a Turkish man who wrote to me: “… but who did you get to accompany you? If I came to Venice or Florence, surely you wouldn’t make me look at hideousness such as this!” He was offended, because this year Istanbul is the European Capital of Culture, and hence under the gaze of everybody. As a matter of fact, notwithstanding current powerful contradictions, the city on the Bosphorus has had an illustrious past. Today, because of its enormous urban sprawl it has become difficult to photographically investigate in its totality, so you have to make precise choices. B.F.: What interests you the most when you go through a city? Its formal appearance, the aesthetic of the object, or rather its “contents”, that is the social aspect, the life of the inhabitants? G.B. : Perhaps neither one nor the other, in an absolute sense. I am a documentary photographer and I like to depict the space precisely, toobtain a very realistic photograph, without distorting or abstracting too much that which is seen. B.F.: So being a realist means to faithfully reproduce a (presumed) objective reality? G.B. : No, I would say that behind realism there remains the necessity for creating poetry or a story. In translation it means: to make the viewer see more than that which can be seen, to work on the intuition. A photograph must set off the imagination, but it must also pose questions. With images that are abstract or otherwise of a conceptual nature, one creates, at times, a kind of puzzle which is difficult to solve. There is, however, a more direct way of communicating by means of photography: when beyond the image of the real, one senses a second meaning which manages to intrigue. In those instances when this mechanism can be perceived – because, in truth, it’s not a given that it always functions – we approach the realm of art. B.F.: One could say that we are dealing with a “document” which ideally conveys a deeper meaning? G.B. : Yes, precisely. As far as the landscape is concerned, I’m not interested in the aesthetically “nice photo”, like those in tourism brochures. On the contrary, I am interested in telling a story: in my ideal book, which tells of and compares other cities, I would like to include the experience of Istanbul. B.F.: So every city gives rise to a different story? G.B. : Certainly, to work on a city means to choose from urban typologies. With identity of the place as the departure point, you develop a particular idea. 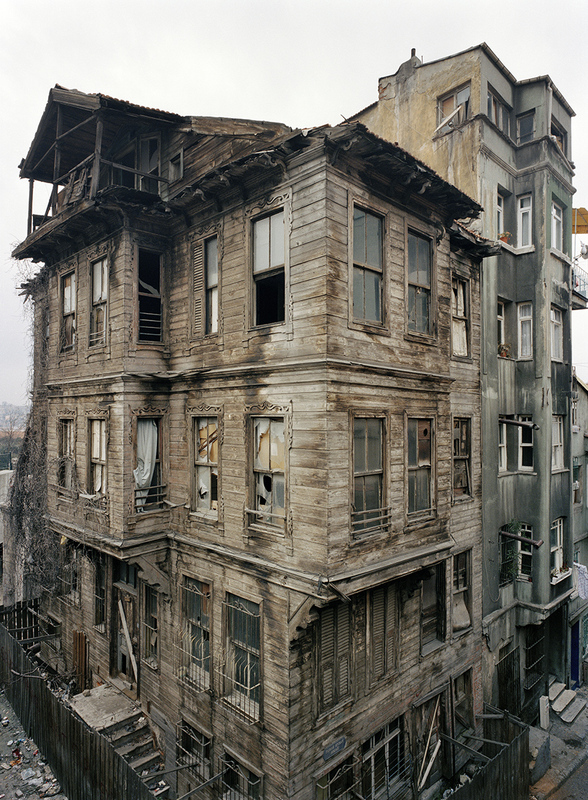 In Istanbul I chose to work on the theme of transformation, which is concretely visible in the periphery. I like to read the morphological change: to go to the outskirts, to see the new buildings. B.F.: You’ve visited Istanbul more than once? G.B. : Yes, for the first time quite long ago, in 1970, during a long journey on my way to Persepolis in Iran, and then another two times, more recently, in 2005 and 2010. B.F.: How do you make urban transformation visible? It is in itself an extremely slow process. G.B. : Forty years ago, when I went to Istanbul for the first time, it had 2,300,000 inhabitants as opposed to the 16 million today. In the poorer areas (those disputed by the Turkish gentleman) there were delightful little wooden houses. Now very few remain. With the assistance of an architectural historian I managed to find a few of the surviving ones and I took pictures of them. B.F.: The exhibition contrasts two extremes, the new periphery and the historic centre. G.B. : Not only. 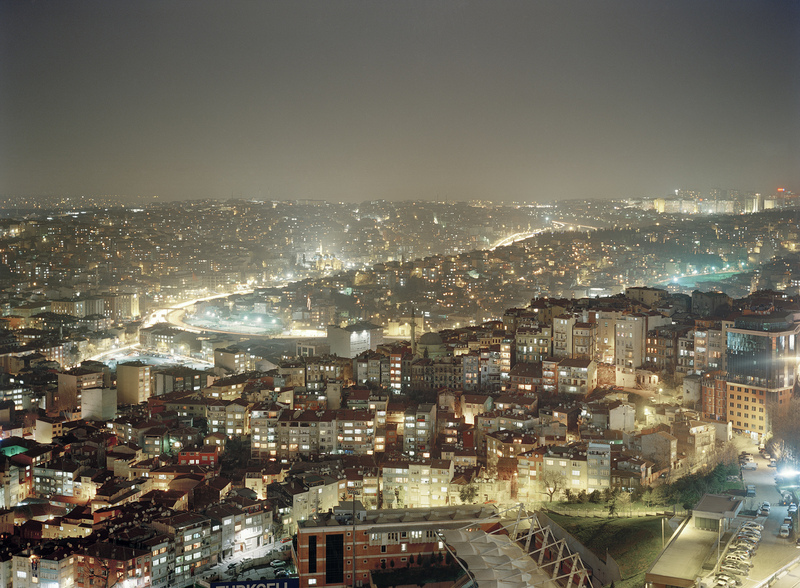 Istanbul was built on hilly terrain which holds endless surprises. I really liked Luca Doninelli’s text*1, the work of a sensitive writer. He tends to use photography to go on a journey with you, and describes to you what you are seeing, like Calvino or Celati. I find that extraordinary. B.F.: I was particularly struck when Doninelli wrote that each city has a “certain quality of walking” which is like its digital imprint, and how one differentiates a New York kilometre from a Beijing or Cairo kilometre. I was particularly interested to find out your attitude towards differences. G.B. : What goes on in the mind of a photographer or an architect whilst exploring a place? There is something which is common to both, a way of looking: a certain attention which has been well described by Walter Benjamin when he talks of the passages of Paris, or by Joseph Roth when he writes about white cities and describes them as if they were people. I am often asked why there aren’t any people in my photographs… aren’t cities similar to living beings? B.F.: Let’s ask the youngsters. Cecilia: Because you want to concentrate on the city itself and not on that which is in the city. 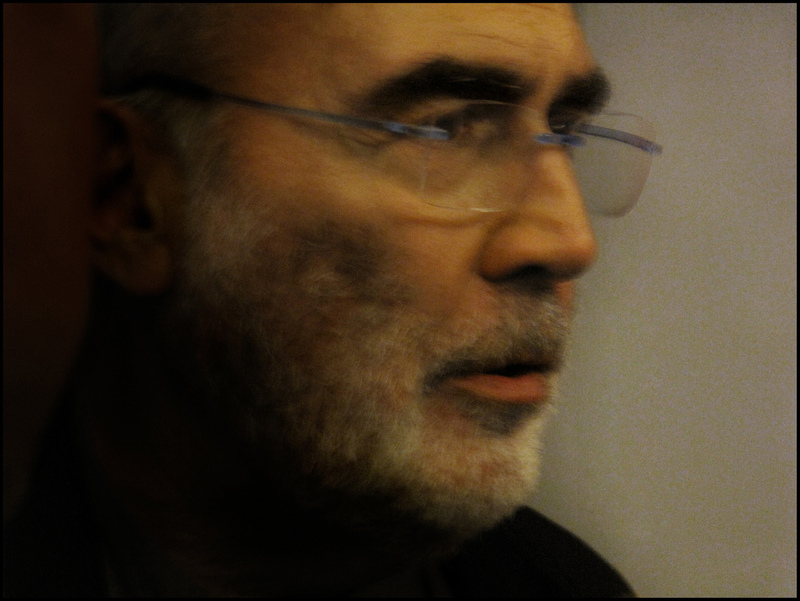 Piero: Maybe you are more interested in the architecture rathernthan the sociological or social aspect. B.F.: Perhaps you could say that the city is an image which represents its inhabitants, a kind of metaphor. Maybe it’s not necessaryto see them in order to understand that the photos are indirectly speaking of their lives. G.B. : You can deduct from the way people behave, how they feel, what kind of person they are. Also with architecture you can suppose, in contradiction to the saying that “you can judge a book by its cover”. B.F.: You say that you are a documentarist. This makes me think of Eugène Atget, who at the end of the 19th century systematically recorded the city of Paris in his photos, following pre-determined typologies. I wanted to know how you archive your photos: do you proceed according to typology, chronology or place? G.B. : I identify them in a very simple manner: I give them a code, a number, a date. G.B. : Yes, chronologically, negatives and contact proofs are filed separately and are always traceable. But as for the rest – unfortunately, it is all based on personal memory. B.F.: I would like to ask you a question regarding methodology. In your work, do you have a preparatory project for each city, with predetermined categories, or do you proceed like a drifter, led by the situation, wandering along the street without knowing what you may find? G.B. : To discover the city whilst rambling around like a stroller is probably more amusing, but on the other hand for me there are also the requirements of a rigorous project. G.B. : Not really, because what interests me is linked to aspects of the transformation of cities. To orient myself, to know where to go, I have to – out of necessity – question some expert who can accompany me to new neighbourhoods, who can point them out to me on maps, in order to be able to make on-site investigations. B.F.: There you are – so there is a preliminary project. G.B. : Of course, absolutely, that’s fundamental! It gives me, among other things, the shape of what needs to be done. Then, within a planned scheme, it is always the sight which helps me to choose and realise the shots. G.B. : I try to “read” the city with intentionality. I choose the position of the point of view, adapting myself to the space, like a tailor who is sewing a garment made to measure. B.F.: Given that you are an architect by education, what brought about the wish to document architectural works of others rather than actually constructing buildings? Could it be said that your photographs are architecturally planned, based on very rigorous composition, which can be observed in the manner in which you handle space? G.B. : I graduated in 1973. At that time in the faculty you mainly gained political and social experience. With my first camera, it was more natural to record what was happening in the city, the demonstrations and the sit-ins, for example. And only much, much later my attention shifted to buildings and the urban landscape. At the beginning, I was lucky enough to be acquainted with excellent photographers, who helped me. What swept me away was the commitment of the reporter, and that was the thing, at the time, that I loved to bits. B.F.: Hence your photography made its debut as social testimony. G.B. : I found that I got on better with photography than with architecture. By taking photos of architecture, I was able to unite the twothings. In fact, some have said about my work that it’s like a genuine architectural project, done with photography. B.F.: At the same time it is also a historical elaboration, however. Some of your photos are black and white, yet others are in colour. I’ll ask the youngsters. In your opinion, apart from the presence or absence of colour, what changes? B.F.: Did you mean that colour adds realism, possibly? The pictures seem more real? Sofia: Quite sincerely, in black and white photos I see the play of light and shadow more than in colour photos. G.B. : So you see more of the design, the shapes. About colour they always say that it is more realistic. Sofia: I would like to know on what basis you take photos in colour rather than in black and white. G.B. : Let’s say that towards the end of the 1960s, when I began taking photos, fine art photos were only in black and white, whilst coloured photos were considered commercial. Halfway through the 1970s, colour made its appearance in fine art photography. B.F.: But for you personally? Under what circumstances do you choose which type? G.B. : Really, I have always been attracted to black and white, for some forty years now. The first series in colour occurred accidentally in 1991, because I had used up all the black and white film, this was during my work on Beirut. Personally it doesn’t make that much difference to me. Colour offers more information and perhaps has a more narrative aspect. B.F.: And with black and white one concentrates more on form? G.B. : Certainly, it is well-known that when you remove the information of colour, the eye tends to concentrate more on form, the light and shade and the design. For example, returning to Istanbul, the series in black and white of street scenes were like monuments: they reminded me a lot of the pictures of Paris by Atget. You can look at a city from up high in order to contemplate it and to measure its extent with your eye, but if you want to get to know it, you have to walk around inside it. B.F.: You have to penetrate it. G.B. : To feel its breath. A city is teeming with sensations. Sofia: You said that there is a difference between seeing a city from the outside or from within. So was it a conscious choice to have placed at the beginning of the exhibition a bird’s-eye view and at the end pictures of street scenes as the peaks of internality? G.B. : Certainly, when you are staging an exhibition, you are also creating an additional project. In this regard photographers have learnt a lot from artists. Once upon a time, no one really bothered much about the arrangement of the exhibition space. You could perhaps say that the movement from the aesthetic aspect to the social side, that which we talked about at the beginning, is reflected in the movement from the panoramic view to that of the street, from the periphery to the centre, from the outside to the inside. If you look at a city from the air, it seems that you can take it into your hand, but then you have to enter inside it. You establish a kind of dialogue between an earthly dimension and another which is slightly transcendental. B.F.: Where the city touches the sky. G.B. : I’m going to write that down!